Ever wished you could view your Twitter timeline from iOS 5’s Notification Center? WeeTwitter is an iOS tweak that displays your newest tweets, @-replies, private messages and even saved searches right on your Notification Center. 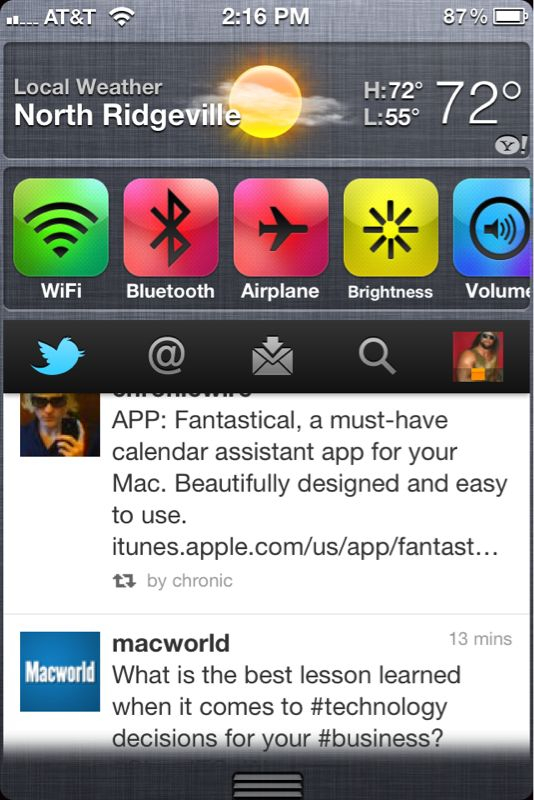 This tweak was developed by Tyler Flowers, a US-based teenager who developed his first iOS app just a few weeks ago. Now he’s venturing in the jailbreak community as well. Step 1: Install MobileTerminal from Cydia and set up iPhone Explorer on your computer (find out how here). Once that’s done, plug your phone into your computer. Step 2: From your computer, download this .deb file. Then launch iPhone Explorer and paste the file you’ve just downloaded into /var/mobile. Step 4: You’re done! Respring or reboot your phone in order to see the changes. If everything goes as planned, your Twitter timeline should now be displayed on your Notification Center. Of course, you need a jailbroken copy of iOS 5 in order to apply this tweak. If you’re currently running iOS 5, there are tethered jailbreaks available, namely Redsn0w (check out our guides for Mac and Windows) and Sn0wbreeze (check out our guide here). If you’re looking for a tethered jailbreak, don’t get your hopes up, since we might not see one anytime soon. Just one week after iOS 5’s release, it’s already clear that the jailbreak community has embraced the operating system’s new features. iOS 5’s Notification Center includes widgets, although no third-party development is officially supported by Apple (at least as of yet). However, unofficial developers have since rolled up their sleeves: the first widget for iOS 5, UISettings, allows users to adjust basic iOS settings right from Notification Center.